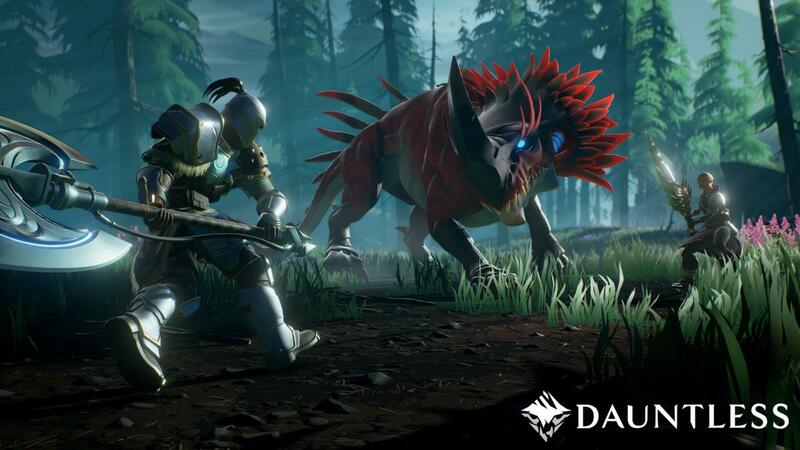 Patch 0.2.7 will soon be rolling out for Dauntless. On October 30, Phoenix Labs will add new character customization, new skins for your weapons and armor, and fix some minor bugs. In addition to customization, a Halloween event has been added. It’s called “The Dark Harvest.” You’ll be able to earn exclusive rewards and seasonal items. This event runs through October 3 to November 7. For further information on the seasonal event click here. Updated and improved the Borrowed Armour. Updated and improved the Borrowed Chain Blades. Added a new dodge move for the hammer (double tap secondary attack) where you do a blast evade with your hammer. At the cost of some ammo, this does damage to anything around the blast point and gives you additional invulnerability frames. This new move is part of our continued process to update the combat system, so be sure to stay tuned for more! Updated the hammer launch move so that it can now be done as soon as the button is pressed instead after reaching sprint speed. Fixed a bug where players couldn’t progress above Tier 3 for the Deadeye Hammer. Fixed a bug where players were not able to progress the Ragetrail Hammer past Tier 1. Updated lanterns so that they now might have resistance bonuses to specific damage types (blaze, frost, radiant, etc.) in addition to the base physical resistance. Fixed a bug that caused some users to crash whenever they were doing a revive. Players are now able to update their appearance in Ramsgate by visiting Gregario. Added multiple new hairstyles and makeup options to the character creator. Players are now able to choose different options on how they wish to set their helmet visibility. Updated and cleaned up elemental damage, resistances and stats to be more understandable and balanceable. This includes changes to having elemental Behemoths do less physical damage and more elemental damage and improvements to armour elemental resistances. Added a new Slayer Power Rating on the hunt board. This is the average of the player’s weapon power and total armour resistance. Replaced placeholder VO with real actors, for Markus (the Bosun), Kat (the Mentor), Gregario (the Stylist), Arkan (the Aethersmith), Gaius (the Cartographer) and Visima (the Wayfinder). Characters will continue to be updated in future patches. Fixed a bug that caused some users to be unable to unsheathe their weapons after climbing up a ledge. Added in-place patching to the Patcher which is now faster and will allow patches to be interrupted and when resumed they will continue from where they were. Fixed a bug where Shrowd could sometimes teleport off the edge of the map. Fixed a bug that sometimes prevented Rezakiri from dissolving on end of hunt screen. Added a new music piece that plays when reaching 100 danger. It will play until the Behemoth flees or the player dies. Rezakiri has had a full sound design pass, replacing the placeholder audio. Fixed a bug that caused footstep sound effects to seem like they were coming from a different location when walking. Fixed a variety of visual bugs related to floating objects. Patched some holes in the maps that allowed players to fall through. Fixed a bug that caused some players to get stuck on certain rocks in the Arid biome. Fixed a bug that caused some players to get stuck when sheathing/unsheathing. Are you looking forward to testing out the new customization options? Let us know below. In other update news, a Forza Motorsport 7 update introduced a credit bonus for VIPs, a Fortnite a “prevalent crash affecting all players,”patch fixed and an Ark PC patch tweaks sleeping and handcuffs.